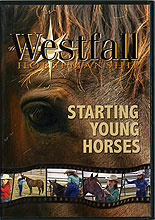 In this DVD, Stacy teaches how to start young horses with a good foundation built by establishing respect through solid groundwork. From first handling to initial riding, methods with an eye toward safety and success. Multiple lessons using a trained horse and an untrained colt, presented in a manner that average horse owners can understand and master with practice and patience.